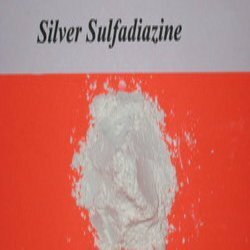 With an aim to stand tall on the expectations of our reliable patrons, we are engaged in offering Silver Sulfadiazine. A type of Sulfa derivative topical antibacterial formula, Silver Sulfadiazine helps in stopping the growth of bacteria that may infect an open wound. This is mostly used for the treatments of second and third degree burns. It is suspended in a water soluble base and is also used to cure other shallow, large-area wounds such as abrasions. In order to carve a distinct niche for ourselves in this domain, we put forth a comprehensive array of Silver Sulfadiazine. Silver sulfadiazine drug works by killing the fungus or bacteria. Silver sulfadiazine cream is applied to the skin and/or burned area(s) to prevent and treat bacterial or fungus infections that may occur in burns. This is available with us at the industry leading prices.